Supposedly it’s summer, though looking out my window right now it’s hard to believe. 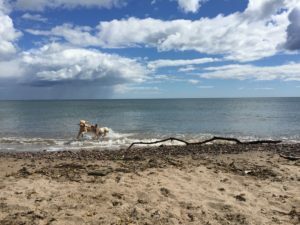 However, there have been some lovely days and I’m so fortunate to live by the beach here in Stonehaven. As you can see, my dogs love it too! 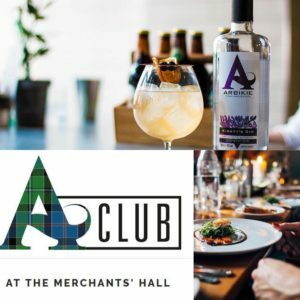 The following Sundays (14th & 21st August), I’ll be playing in fab pop up ‘The A Club’ which is taking residence in the Merchant’s Hall in Edinburgh for the duration of the festival. Ardbickie Distilleries, those makers of very fine gin, are operating the venue. This is going to be a unique venue where we performers get to give you a full performance, rather than the typical one hour slot’s elsewhere. Those who’ve attended the fringe in previous years will be familiar with the pressure on venues to get their audiences in and out as quickly as possible for a show of one hour or less. In this glamorous venue, the audience get to be seated at tables where they’ll enjoy table service and a menu of delish food and delectable cocktails (sadly I shan’t get to try those till after gig). Not only that but you get to relax for several hours escaping the frantic rushing around from show to show happening elsewhere! Check the events page for links for booking. Enjoy and please keep supporting live music. We musicians need you, performances only really come alive when we’ve got an audience so you’re an integral part of what we do!